As the days, weeks, months and years go by, I find myself worrying more and more about wrinkles. And isn't that just what causes wrinkles to appear in the first place? Then I feel lucky because in this day and age, there are tons of products created to combat the appearance of wrinkles. But then I start to worry again, because how do I choose the one that's right for me? So you can imagine my happy surprise when Elizabeth Arden Prevage Night Anti-Aging Restorative Cream landed on my desk. I took it home, intrigued by the promise to restore firmness and elasticity to my skin, combat aging and enhance my skin's natural repair process with a combination of Idebenone, Mega Complex-A and a blend of high-performing moisturizers. Even more intriguing was the fact that it should only be used at night, so that all of these great formulas can come together while you're getting your beauty rest -- ahem, pardon the pun. My absolute favorite part of application has got to be the handy-dandy little button that, when pushed, releases just the right amount of orange creamsicle-colored cream to slather on my face. After only a few uses, I'm happy to say the wrinkles seem to have reduced -- and the fact that I look like I got a facial after every application sure doesn't hurt! 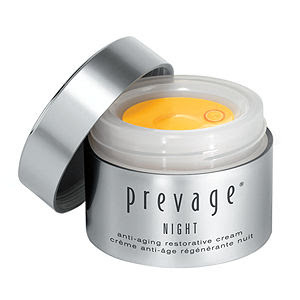 Elizabeth Arden Prevage Night Anti-Aging Restorative Cream retails for $132 at beauty.com.